(CNN) -- Al Qaeda leader Osama bin Laden has apparently released a new audio message calling for a jihad, or holy war, against Israel for its Gaza campaign. Osama bin Laden, in an undated photo, apparently taped a message calling for jihad against Israel. The 22-minute message contains "an invitation" from bin Laden to take part in "jihad to stop the aggression against Gaza." 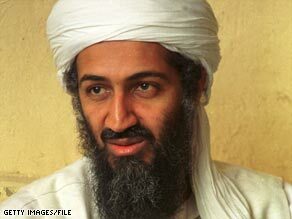 The audio message was posted on a radical Islamist Web site that has posted other statements from bin Laden in the past. CNN could not independently confirm the authenticity of the message, but the speaker's voice was similar to other recordings that bin Laden has made. "[America is] now drowning in a global financial crisis," he said. "They're even begging all nations, small and large, for help. America is no longer feared by its enemies nor respected by its allies. "The decline of the American power is one of the main reasons for Israel's rushed and barbaric aggression on Gaza in a desperate attempt to take advantage of the last days of [President] Bush's term in office." The message also names Vice President-elect Joe Biden. "Here is Biden, the vice president of the president-elect ... [he] says that the crisis is bigger than they expected and that the American economy, all of it, is open to collapse," bin Laden said. On December 20, Biden said in an interview that the economy "is in much worse shape than we thought it was in." White House spokesman Gordon Johndroe said the message "demonstrates [bin Laden's] isolation and continued attempts to remain relevant at a time when al Qaeda's ideology, mission and agenda are being questioned and challenged throughout the world." He noted that the message also appears to be "an effort to raise money as part of [al Qaeda's] ongoing propaganda campaign." "The United States promotes an alternative, hopeful ideology while continuing to partner with over 90 countries to pursue terrorists wherever they are," Johndroe said. The last time bin Laden released an audio message was in mid-May, timed to coincide with Israel's 60th anniversary. That message urged his followers to liberate Palestine. Israel launched a military offensive in Gaza on December 27 to stop Hamas rocket strikes on southern Israel. The death toll in Gaza was nearing 1,000 on Wednesday, including more than 300 children, according to Palestinian medical sources. The Israeli toll stood at 13, including three civilians, according to Israeli police and military officials. Bin Laden, who is about 51, is the head of the al Qaeda terrorist network, which was responsible for the September 11, 2001, attack on the United States that killed 2,751 people. He's been in hiding since the U.S. assault on Afghanistan that followed the 9/11 attacks. The U.S. government is offering a $25 million reward for information leading to his capture. President Bush, whose term ends next week, told CNN's Larry King on Tuesday that he remains optimistic that bin Laden would be found. Asked by King, "Are we ever going to find bin Laden?" Bush replied: "Yes, of course, absolutely. We've got a lot of people out there looking for him, a lot of assets. You can't run forever." The message is important to the incoming U.S. president because it signifies that bin Laden is still "out there," said Tim Roemer, a former Democratic congressman from Indiana who served on both the congressional and the presidential September 11 commissions. "It's a reminder of President-elect Obama's inheritance of some of the difficult problems out there that he has to confront," said Roemer, who is president of the Center for National Policy. "This reminds us of what bin Laden said right after 9/11. He said it wasn't 19 Arab armies or 19 Arab states that attacked the United States. It was 19 post-graduate students. It reminds us how much the world has changed, and how many different threats are out there today." CNN's Octavia Nasr and Suzanne Malveaux contributed to this report.